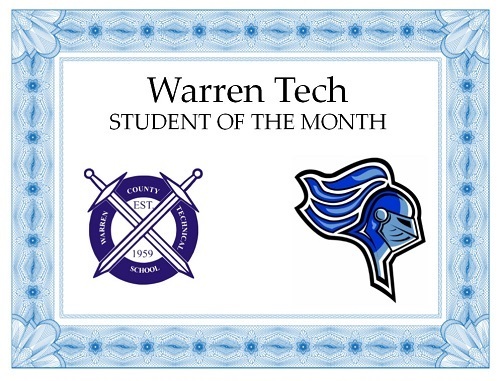 The January 2017 Students of the Month were recently honored at the Warren Tech Board of Education meeting on February 15th. Senior Phillip Sullivan earned the honors for Automotive Technology Student of the Month, Sophomore Veronica Hom earned Social Studies Student of the Month, Freshman Taylor Van Puttin Vink earned Electrical Applications Student of the Month, and Sophomore Richard Cruz was honored for the School service Award. Phillip Sullivan was nominated for the award by Mr. Danner. Mr. Danner notes that Phillip is respectful, conscientious and enthusiastic about the automotive industry. The senior participates in classroom lectures and stays on task in the shop. He always has a positive attitude and great work ethic, and wants to do a quality job the first time. His willingness to help others in the shop and classroom is a great asset. His classroom performance ranks in the top of his class, always wanting to continue to learn. Mr. Danner notes that Phillip will be a valuable asset to any company or organization and will be a top technician in the field one day. Veronica Hom was nominated for the Social Studies student of the month honors by Mr. Lance. Mr. Lance notes that Veronica is a US I Honors student who does exemplary work, and her questions and answers during classroom discussions are mature, thoughtful, and insightful. Taylor Van Puttin Vink was nominated for the Electrical Applications Student of the Month by Mr. Izzo. Mr. Izzo points out that Taylor is a freshman who has strong desire to learn the the field of Electrical applications. She is very respectful to everyone in class and is often the first person to volunteer to do a job and she proactively seeks out work. Taylor volunteered to assist recruiting efforts this year for the Electrical Applications program and visited several middle schools to speak with the eighth graders about the program. Taylor has maintained an "A" average in her shop through the first two marking periods. Sophomore Richard Cruz earned the School Service Award. The School Service Award is given to a student who is the model of school spirit. The School Service Award is awarded to students who joins clubs, activities and sports. The award honors students who participate in school activities. These students are excited, proud and represent our belief system.